MORE FREE STUFF!!! We’re exhibiting at the Philly Bike Expo this weekend with sizing samples of our new jerseys. Yup, you’ll be able to order them on the spot! We’ll also be selling various art prints and giving away little trinkets. To get the word out we’re running another contest! “Regram” this image w/your size and the hashtag #justeleanorpbe and you’re entered for a chance at a free jersey! We’ll be picking the winner after the dust settles . 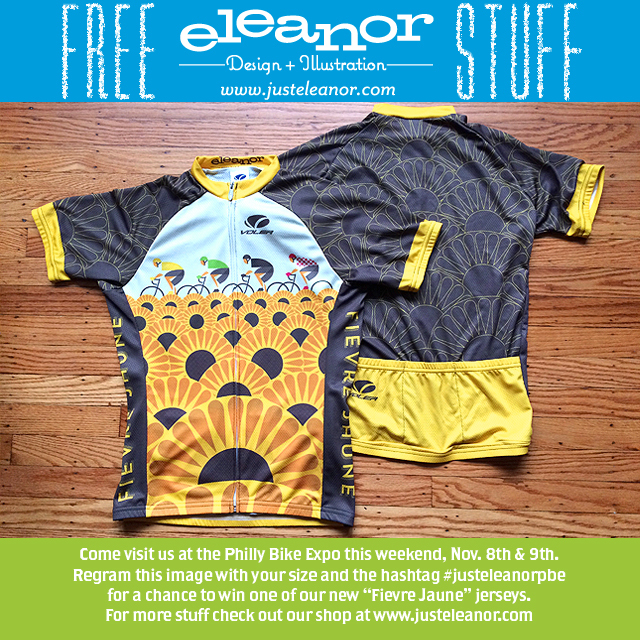 This entry was posted in Uncategorized and tagged free stuff, giveaway, Philly Bike Expo on 11/06/2014 by admin.